In 1952, after graduating from high school she could not afford to go to university. Her next few years were spent in a diverse array of jobs, such as a secretary at Oxford University, choosing music for documentaries for a London filmmaking company and a waitress. Then in 1956, a friend of hers invited Jane to visit her family’s farm in Kenya. Caching away her earnings Jane was finally able to travel to Kenya the following year at the age of 23, and so embark on a journey that would alter the course of her life forever. While in Kenya she met the famous anthropologist and paleontologist Dr. Louis Leakey, the man who would help to bring her dream to reality. Jane was able to impress Leakey with her knowledge of Africa and its wildlife to the extent that he hired her as his assistant. Along with Leakey and his wife, archaeologist Mary Leakey, Jane travelled to Olduvai Gorge in Tanzania on a fossil-hunting expedition. Reminiscing of her time at Olduvai Gorge, Jane says, “I could have learned a whole lot more about fossils and become a paleontologist. But my childhood dream was as strong as ever – somehow I must find a way to watch free, wild animals live their own, undisturbed lives – I wanted to learn things no one else knew, uncover secrets through patient observation.” And so she did. Leakey and Jane began a study of wild chimpanzees on the shore of Lake Tanganyika. But British authorities resist the idea of a young woman living among wild animals in Africa. Leakey persuaded them with the proposal of Jane’s mother, Vanne, volunteering to accompany her daughter for the first three months. Jane and Vanne arrive on the shores of Gombe Stream Chimpanzee Reserve in western Tanzania in the summer of 1960. 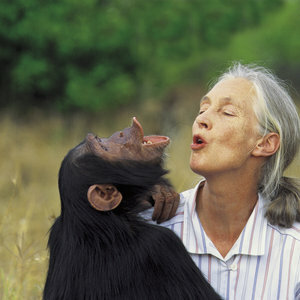 Jane realizes that studying the chimpanzees of Gombe will not be simple with the animals fleeing from her in fear. Progressively she is able to habituate them and so began her ground-breaking research that altered our way of thinking of these creatures. And so began the public image of the lady among the chimps. 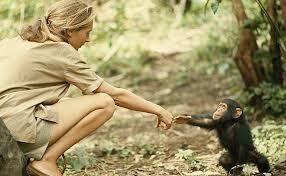 In 1963 she published her first article, “My Life among Wild Chimpanzees”, in National Geographic. Then in 1965 National Geographic granted funds for the construction of the first permanent structures at Gombe, Gombe Stream Research Centre is born. Jane Goodall then founded the Jane Goodall Institute in 1977 which still to this day promotes wildlife research, education and conservation. The course of Jane’s life was changed when she attended the conference in 1986, organized around the release of her work ‘The Chimpanzees of Gombe: Patterns of Behaviour’. It was there that she came to know the full extent of the habitat destruction going on across Africa and its threat to the survival of her beloved chimps. For Jane life at Gombe would end for she realized she would have to leave it and work to conserve not only the chimps and other wildlife but also where they called home. 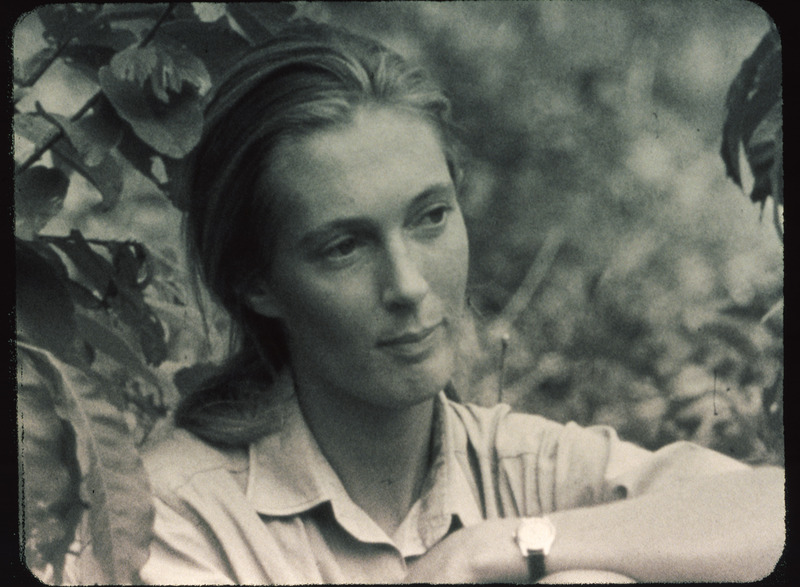 Jane went on to create many conservation projects, for wildlife conservation as well as sustainable living. Along with sixteen Tanzanian students in 1991 Jane founded Roots & Shoots – the Jane Goodall Institutes’ global environmental and humanitarian education program for youth. Her work is endless, travelling on average of 300 days a year to raise awareness of the threats facing chimps, other environmental crises and her ‘reasons for hope’ – that we will ultimately resolve the problems that we have imposed on the earth. Jane Goodall continues to urge her audiences to recognize their personal power and responsibility to affect positive change through consumer action, lifestyle change and activism.